The death of one of the most conservative members of the US Supreme Court, Justice Antonin Scalia, has sparked arguments over the process to find his successor. President Barack Obama said he would nominate a replacement. 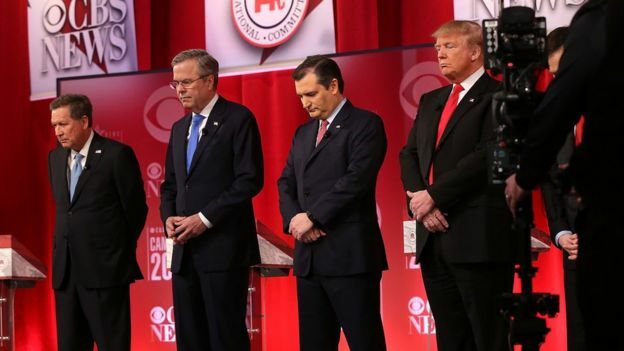 But the Republican candidates for the presidential nomination have called for a delay until after the election. Before Justice Scalia’s death, the US high court had a conservative 5-4 majority. What next for the Supreme Court? It succeeded in stalling major efforts by the Obama administration on climate change and immigration. With places on the Supreme Court now balanced 4-4 between liberals and conservatives, the fight for influence in one of the highest forums for decision-making in the US promises to be as fraught as the current presidential race. 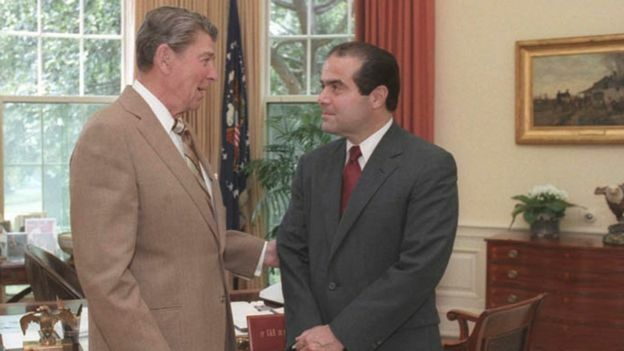 Justice Scalia, who was 79, was appointed by President Ronald Reagan in 1986. He died in his sleep early on Saturday. “For almost 30 years, Justice Scalia was a larger-than-life presence on the bench,” President Obama said, calling him “an extraordinary judicial thinker” with “an incisive wit”. Leading Democrats have expressed their eagerness for a new judge to be appointed soon. Fellow candidate Bernie Sanders urged the party to “get on with it”. Any nominee for the Supreme Court would have to be approved by the Republican-controlled Senate, which could also delay a decision until after the 2016 election. Senate Majority Leader Mitch McConnell said the post “should not be filled until we have a new president”. President Obama said he hoped the Senate would respect his nomination to the court and “fulfil its responsibility to give that person a fair hearing and a timely vote”. Born in 1936 in Trenton, New Jersey, Justice Scalia was the first Italian American to serve on the high court. He was one of the most prominent proponents of so-called originalism – a conservative legal philosophy that believes the US Constitution has a fixed meaning and does not change with the times. In 2008, Justice Scalia delivered the opinion in District of Columbia v Heller, a landmark case that affirmed an individual’s right to possess a handgun. Throughout his career, the outspoken justice was a vocal opponent of abortion and gay rights, often writing scathing dissenting opinions. In the majority, he supported business interests and was a strong advocate for the death penalty, but he often parted with his conservative colleagues on issues of free speech. He was known for his sense of humour and colourful language, calling efforts to defend President Obama’s healthcare reform law “jiggery-pokery” and “pure applesauce”. 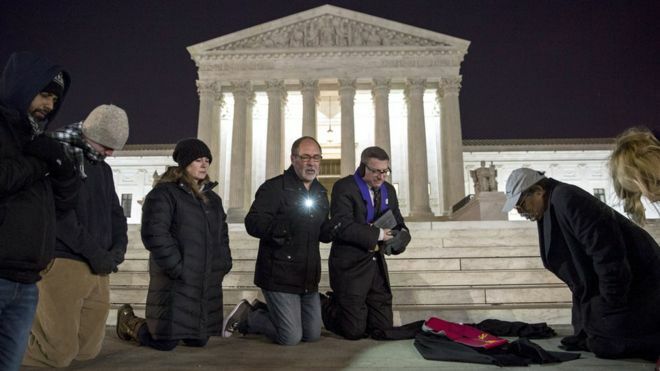 The Supreme Court will continue to hear cases during the current term, with or without a replacement, including a major case involving abortion rights. 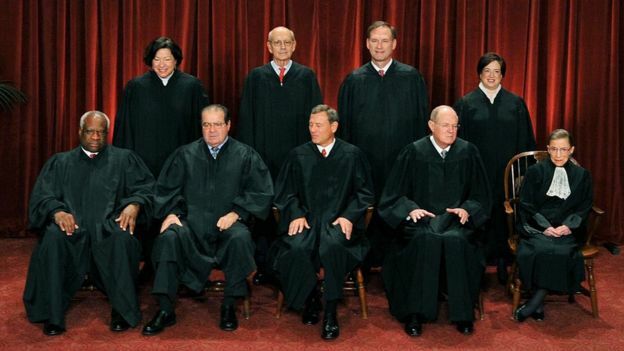 US Supreme Court justices are appointed to life terms by the president with the approval of the US Senate. Appointed by Democratic presidents are associate justices Ruth Bader Ginsburg, 82, Sonia Sotomayor, 61, Stephen Breyer, 77, and Elena Kagan, 55, who make up the court’s liberal wing. Appointed by Republican presidents are Chief Justice John Roberts, 61, along with justices Clarence Thomas, 67, Anthony Kennedy, 79, and Samuel Alito, 65, who are the court’s conservative bloc.